Types of fire extinguisher – all you need to know, explained in our uncomplicated guide. 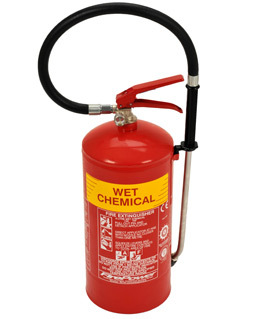 There are 5 main fire extinguisher types – Water, Foam, Dry Powder, CO2 and Wet Chemical. You should have the right types of fire extinguisher for your premises, or you may not meet current regulations. The various types of fire extinguisher put out fires started with different types of fuel – these are called ‘classes’ of fire. The fire risk from the different classes of fire in your business premises will determine which fire extinguisher types you need. You will also need to make sure that you have the right size and weight of fire extinguisher as well as the right kind. There is no one extinguisher type which works on all classes of fire. Below is a summary of the classes of fire, and a quick reference chart showing which types of extinguisher should be used on each. We then provide a detailed explanation of each type of fire extinguisher below. 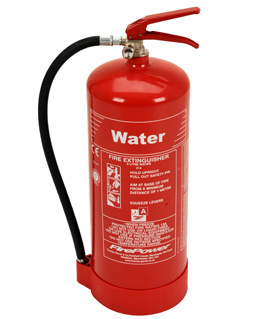 Water extinguishers are the most common fire extinguisher type for class A fire risk. Most premises will require either water or foam extinguishers. The water has a cooling effect on the fuel, causing it to burn much more slowly until the flames are eventually extinguished. Types of premises/business who may need water extinguishers:Buildings constructed of wood or other organic materials, premises where there are organic materials to be found such as: Offices' Schools, Hospitals, Residential properties, Warehouses, In fact most buildings need either water or foam extinguishers. Water spray extinguishers – what’s the difference? Water spray extinguishers are equipped with a spray nozzle, rather than a jet nozzle, meaning a greater surface area can be covered more quickly and the fire put out more rapidly. Water mist extinguishers – what’s the difference? Water mist extinguishers have a different type of nozzle again which releases microscopic water particles. These particles ‘suffocate’ the fire and create a wall of mist between the fire and the person using the extinguisher, reducing the feeling of heat. 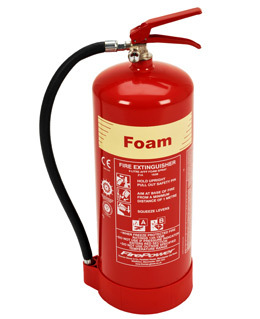 Foam extinguishers are most common type of fire extinguisher for Class B fires, but also work on Class A fires as they are water-based. As with water extinguishers, foam extinguishers have a cooling effect on the fuel. On burning liquids, the foaming agent creates a barrier between the flame and the fuel, extinguishing the fire. Standard dry powder extinguishers are also called ‘ABC’ extinguishers because they tackle class A, B and C fires, however they are not recommended for use in enclosed spaces. This is because the powder can be easily inhaled, and also the residue is very difficult to clean up after. ABC powder extinguishers can also be used on some electrical fires. 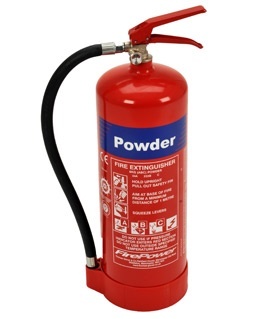 Specialist dry powder extinguishers are used for flammable metals. Plus: Fires involving electrical equipment up to 1000v, specialist dry powder extinguishers are only used on flammable metals, such as titanium and magnesium. Dry powder extinguishers smother fires by forming a barrier between the fuel and the source of oxygen. Place dry powder extinguishers near to the source of the fire risk. Specialist dry powder extinguishers work in the same way as standard dry powder extinguishers but are for use with flammable metals only. There are 2 types of specialist dry powder extinguishers – ‘L2’ which only tackles lithium fires, and ‘M28’, for all other flammable metal fires. 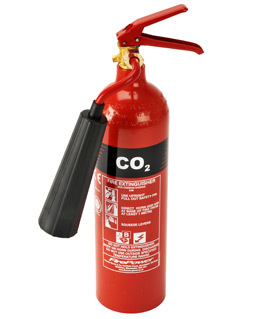 CO2 extinguishers are predominantly used for electrical fire risks and are usually the main fire extinguisher type provided in computer server rooms. They also put out Class B fires (flammable liquids, such as paint and petroleum). CO2 extinguishers suffocate fires by displacing the oxygen the fire needs to burn. All work vehicles should also carry a smaller 2kg CO2 extinguisher. Place near to the source of the fire risk and/or near the fire exits. Wet chemical extinguishers are designed for use on Class F fires, involving cooking oils and fats. They can also be used on Class A fires although it is more usual to have a foam or water extinguisher for this type of fire risk. Wet chemical extinguishers create a layer of foam on the surface of the burning oil or fat, preventing oxygen from fuelling the fire any further. The spray also has a cooling effect. Place near to the source of the fire risk.